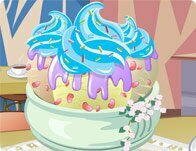 Description: Ice cold scoops of creamy sweet fun times are yours to behold! Dive into some delicious chocolate covered, candy coated, fruit drizzled adventure with this one of a kind delicious dessert surprise! Instructions: Use your mouse to click on and through the floating ice cream, chocolate, sprinkle, candy, cause and fruit options.